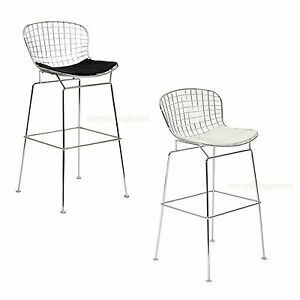 BERTOIA COUNTER STOOL 25" H CHROME WIRE BLACK WHITE PAD RESTAURANT USE 275 LBS! Details about BERTOIA WIRE BAR STOOL CHROME 30.5" HGT BLK WHITE PAD COMMERCIAL GRADE 331 LBS! BERTOIA WIRE BAR STOOL CHROME 30.5" HGT BLK WHITE PAD COMMERCIAL GRADE 331 LBS!